I The problem: democracy, government size: wrong issue? The clamor for decentralization and smaller government is becoming so insistent that one gets suspicious. Who might be so interested in this — other than the poor citizens who feel so oppressed by the heavy hand of government that they don’t even begin to question the mantra? Voices from antiquity seem forgotten: “Divide et impera…” (‘Divide and conquer”) Who might be so intent on this, to rule by dividing us? For all the problems of big government and the current manifestations of democracy (the very superiority of which is being called onto question by people who suffer from the incessant efforts of the big ‘democracies’ who are so heavy-handedly trying to introduce it in ‘developing’ regions), is it possible that it is all a wrong question, even deliberate smokescreen? The arguments in favor of democracy are based on the ideal concept and aim: to ensure that all concerns and worries of all the people are being duly considered and met by ‘government’ decisions that affect them all (albeit in different ways). It is hard to argue with this ideal and with the view that there is no better concept of governance than democracy to achieve this, for all its flaws. It is the flaws that arguments against democracy are focused on: its cost, its cumbersome procedures, the size of resulting governments (whether or not this is due to democracy itself), the vulnerability to temptations of corruption, the ‘tyranny of the majority’ resulting from the majority-rule decision criteria, resulting in decisions that quite often end up hurting a lot of people, the appearance of government ending up working more for its own interests than for the people, in spite of the arrangements to rein in it power. Does the fact that all other known forms of government tend to suffer from the same flaws suggest that there may be some key issues that are being consistently missed in this discussion? If so — rather than just jumping on the ‘smaller government’ bandwagon — it may be helpful to look at the basic underlying requirements for getting closer to the ideals mentioned above: to appropriately meet the concerns of all parties affected by governmental decisions as well as other influences in society. 1) The forum for communication and articulation of the concerns, desires, ideas. Such a ‘forum’ (the ‘marketplace’ for public discourse) must be accessible to all to voice concerns, problems, proposals, questions, arguments. It should effectively make the contributions accessible (visible) to all, in a way that allows convenient overview and forming judgments that in the end will support decisions — even in the form of ‘learning’ that is, revising judgments from their original ‘offhand’ position to more ‘deliberated’ opinions. The larger the scope of problems and needed decisions become, the more this framework will need to include ‘translation’ functions to ensure full understanding: translation not only from one language to another (i.e. all languages involved into each other) but also the ‘languages’ of different disciplines contributing to the discourse, (that have developed their own ‘jargon’ in analyzing problems) to become understandable to people a outside those disciplines. 2) Linking the outcome of discourse to the eventual decisions. Discussions and all the information they generate are useless (in view of the democratic ideals) if they cannot meaningfully influence the decisions made in the end. 2b): A meaningful, transparent approach to linking the measure of argument merit to the criteria used in reaching decisions. 3) Ensuring adherence to agreements and decisions: the problem of sanctions. 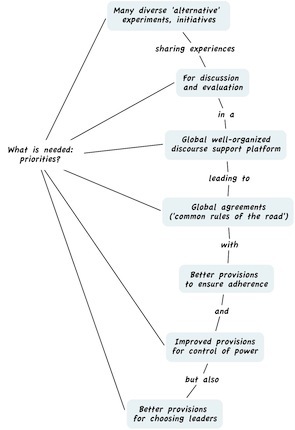 To the extent societal decisions involve agreements (also called ‘treaties’ or ‘contracts’ for decisions involving separate sovereign entities, or ‘laws’ involving agreements that apply to identifiable classes of similar behavior or phenomena, that are agreed upon to avoid having to re-negotiate agreements for each occurrence of such incidents ) there will have to be appropriate means to ensure that agreements, treaties, contracts, laws are adhered to and honored. This is usually discussed in terms of ‘sanctions’ imposed for the violation of such agreements and laws that must be ‘enforced’ — a principle which frequently breaks down at the top of all levels of government but becomes supremely critical at the highest global levels of power because there is no greater power to ensure adherence. 4) Control of power. To the extent that implementation of actions, programs, projects agreed upon, and the enforcement of adherence to the decisions is assigned to special persons or entities in society that are thereby given the power to carry out these responsibilities, there will have to be arrangements for the control of such powers, to prevent them from abusing their power to serve their own interests rather than the common interest: the phenomenon occurring in all known forms of government known as ‘corruption’. These aspects call for some explanation of their significance — and the way they apply to most if not all forms of government — and of the dilemmas and problems involved in current forms of addressing them. It is, however, my opinion that better alternative means of addressing these problems are not only very much needed but also available or within reach. They will be discussed as they apply to each of the above items. Aspect (1): Forum for communication. Traditional forms of democratic / republican government have relied on the tool of representation. In very small communities, representation is achieved by actual presence of the affected parties — in ‘town hall’ meetings and assemblies. For any larger forms, where time (away from regular day-to-day activities) and travel to the place of governance prohibits ordinary citizens from attending, this concern is met in approximated form through election of ‘representatives’ charged with conveying the concerns and desires of the people to the forum and decision-makers. The larger the governmental structures, the more difficult it becomes to ensure that this ‘representation’ is adequate (i.e. matching the actual concerns and views of the people represented). Especially, when representatives are ‘elected’ on the basis of their platform (determined by political parties) on the basis of majority-rule election results in which significant percentage of the population does not participate, for whatever reason. The concerns about conveying to citizens an adequate overview of the discourse, the concerns of other affected parties, and of everybody ‘learning’ from all that information also become less convincingly served. Modern media and technology of communication could improve on these problems, but currently suffer from several serious problems: the information available quickly leads to ‘information overload’ that ordinary citizens have little chance to overcome; Current means of reporting on the discourse lack the vital aspect of condensed overview; and to the extent actual discussion is being carried on in internet fora, blogs, networks, the discussion is fragmented, beset by repetition, incompleteness (because each forum often already is aligned with one ‘side’ or the other of an issue, in addition to a certain systemic incompleteness of pro/con argumentation) and sliding into personal attacks and mudslinging removed form the actual issue at hand. The potential of new information technology for facilitating even large scale (up to global) discourse requires introduction of adequate translation functions, as well as a structure that organizes the information, eliminates repetition and provides overview. While there is currently no single ‘platform’ that offers a good solution to this set of expectations, these needed improvements are entirely within reach with available technology and software. Suggestions for such solutions will be sketched in part III. Aspect (2): Linking the outcome of the discourse to decisions. 2a) A measure of the merit of the information produced in the discourse. If the discourse can be somewhat better organized and structured, it is also possible to have discussion participants engage in more systematic and in-depth assessment e.g. of the pro/con arguments, resulting in measures of plausibility (as perceived by the participants) of action and policy proposals. Suggestions for such provisions have been made; the methodological basis for such solutions is articulated for discussion and can be implemented with current technology, but requires testing, fine-tuning, and education to familiarize people with the approach. 2b) Current decision procedures and criteria — at all levels — fall woefully short of meeting the expectations for truly democratic decision-making. This begins with the election of representatives on the basis of majority rule, which systematically excludes the minority from having its concerns represented. Even where proportional representation ensures that at least all parties achieving a minimum voting support level (e.g. the 5% rule) will have a voice in the legislature, the practice of making the eventual decision based on the majority voting criterion is not only a quite unsatisfactory crutch or ‘shortcut’ for the admittedly desirable concern of reaching a decision at all. It also tends to make the discussion itself a moot issue: if the majority party ‘has’ the votes, no discussion is needed, and will therefore be merely perfunctory. And of course, the interests of the minority will as easily be ignored, to the point of not even attempting to modify the proposed policy to become more acceptable to all concerned. In response to this deficiency, it may be tempting to use any measures resulting from solutions to the problem of (2a) directly as decision measures or at least guides for decisions. This is possible but not advocated for various reasons — mainly the systemic incompleteness of discourse (it will never uncover all concerns and motivations), and the resulting measures of proposal support (plausibility) and their ranges — degree of consensus or disagreement — that can be derived from the argument assessment may also be subject to manipulation. But the availability of such measures will at least encourage negotiation towards proposal modification (compromise as well as actual creative improvement) and discourage final votes that entirely ignore valid concerns of affected parties. Some improvements may also be achieved by considering alternative responses to the following aspect (3) of sanctions to ensure adherence to agreements and laws and (4): control of power. Aspect (3): The problem of ensuring adherence to agreed-upon governance decisions — treaties, laws, contracts — is related to that of the control of power. But it should be examined on its own because there may be remedies that are independent of the power aspect, though it has traditionally almost always been addressed by the tool of ‘enforcement’ by an agency endowed with greater power (ability to credibly threaten and if necessary impose sanctions) than any party to an agreement or contract, or any transgressor of laws. The basic idea is that of ensuring adherence by means of the threat of coercion: of inflicting pain, disadvantages, punishments greater than the advantages expected from breaching the agreement: these threats must of course be ‘enforced’ by an entity bigger and stronger that any prospective transgressor. The very presence of such an enforcement entity is of course a problem in that it will have and pursue its own interests — interests that at times will be at odds with those of other members or segments of the community. It may then be tempted to pursue those interests simply by the explicit or unspoken hint at its own unmatched power. This can generate resentment — deserved or undeserved — that can itself grow to the attempt at resisting the enforcement power by either greater power (open rebellion) or subversive ‘guerilla’ tactics — either one usually not resulting in significant improvements overall, but often merely replacing one big enforcement power with another. While the problem exists at even the smallest size governments, at village, county or county level, it becomes critical at the global or ‘world government’ level. For if the agreements reached by any form of governance model at the global level have to be enforced by an enforcement agency more powerful than any other institution, this agency itself will be tempted by abusing its power to further its own interests, without fearing any interference by other powers. The control of power by other means that the traditional tools then beams critical, and it requires the invention and introduction of new forms of sanctions for breaking laws, agreements and treaties — sanctions that do not require coercive enforcement by a bigger power. The requirement calls for sanctions that are triggered ‘automatically’ by the very attempt at violation. There are technically feasible solutions at small scale for such measures — the Watts steam engine regulator being the original conceptual model. For example, the attempt to breach the contract with society in which we engage at the act of acquiring a drivers license, to not drive while intoxicated, may be less ‘punished’ than prevented by a device that senses whether a driver is intoxicated and immediately blocks the ignition of the vehicle: the contract is temporarily disabled, without the involvement of any enforcement agency. This is an example of a sanction ‘automatically triggered by the attempt at violation’. The development of such solutions for wider application and even for international / global affairs is arguably an extremely urgent necessity. Aspect (4) The control of power has traditionally been dealt with in various ways: In ‘democracies’: time limits for officials and representatives and the necessity of re-election, the possibility of recall or impeachment, the separation and provisions for appropriate balance of powers among the governmental branches, public scrutiny, exposure and ‘shaming’ through the media. In other cultural settings, having decisions made by ‘patriarchs’ (who will listen to polite but noncommittal ‘what-if’ questions in the ‘family council’ that does not require any participant to commit themselves to a firm position before the decision). Patriarchs, at the end of their lives, are assumed to have acquired some wisdom and experience and be less concerned about personal gains and consequences of the decision (less likely to be influenced by temptations than younger people) and therefore likely to pay more attention to the common good of the community. They will make a decision that all participants can then embrace and implement (not having ‘lost face’ by being seen as the losing party like the minority voters in western democracies) and accept the responsibility. Other exempts of conflict resolution by non-coercive means are ‘divine judgments’: for example tossing a coin — though these shave often been elaborated in various dramatic and often also bloody ways. It is becoming increasingly obvious that not only are these traditional tools for the control of power reaching the boundary of their effectiveness — not only because of the size of governments — but also because governments at any size and level are susceptible to the corrupting influence of powers outside government: corporations, religious entities, financial institutions, the media, the military, unions, and other entities that are lobbying legislators and government officials with increasing amounts of financial support. This has reached the absurd level of lobbyists actually writing laws cleverly hiding provisions favorable to their sponsors, that the legislators vote in without even reading all the details. It is therefore necessary to look for alternative and better forms of control of power, not only with regard to the specter of ‘world government’ and any larger size governmental institution — but for any entity endowed with power. A possibly fatal neglect — in honoring the principle of separating government and private business as wells religious institutions — has been that of allowing such entities to grow almost without constraints to amass power — power that has begun to illegitimately influence governments even to the point mentioned, of writing the laws favoring its interests (at the expense of others) which government then is asked to enforce on behalf of those powers. The task to develop new and more effective forms of power controls is the most challenging one, mainly because funding for research, testing and implementation for such tools would have to be allocated by power entities that naturally are not interested in arrangements that would reduce their power. Taken together with the issue of replacing enforcement-type sanctions, it is arguably the most urgently needed, because the ‘enforcement’ tools available today to would-be global powers– the modern military weaponry — are dangerous and destructive enough to threaten human civilization on a global scale. However, some principles can be sketched that can help point the way to better power controls. The first is the recognition that power itself is a kind of human need — in its basic form of ’empowerment’, the condition for realizing ‘freedom’ which is considered a human right. (The issue of ‘rights’ is one also deserving re-thinking, but this is a separate topic.) ‘Freedoms’ without the resources and ability — power — to take advantage of them are nonexistent. Freedom as human right is usually thought of as the ability to pursue one’s own life survival needs and ‘happiness’ — provided they are not interfering with anyone else’s interests. But people perceive freedom both ways: a) as the ability to do or refrain from doing as they please and b) as the ability to prevent or induce others to do or refrain from doing things. Increased power to do (b) is — perhaps perversely and ‘sinfully’ — but most certainly perceived as just as much an increase in one’s ‘freedom’ as that of doing (a). This could mean that effective reduction of the power to do (b) might be achieved through the increase in more appealing opportunities for doing (a), not just constraints on (b). A second aspect is the principle mentioned under aspect (3) above — the possibility of sanctions triggered automatically by the attempt at violation of rules and agreements, instead of coercive sanctions enforced by a bigger power. If such ‘sanctions’ to prevent power abuse were aimed less at punitive effects than at removal of the resources and authority needed to exercise and implement the necessary actions for the violation, this would obviate the need for a superior enforcement power. At the level of global treaties and agreements (laws) the availability of such sanctions would remove the objections to ‘world government’ institutions that are based on the concern of the temptations to power abuse by such a global enforcement agency. A third consideration goes back to the view of power as a human need. While much rhetoric is aimed at the moral obligation to meet human needs most such needs will have to be ‘paid for’ — in one currency or another, by the recipient or somebody else. So this principle might be applied to the need for power as well, and thereby form a constraint on its abuse. This might require a different kind of ‘currency’ — for example, a currency consisting both of elements having to do with competency (as in competency tests for a drivers license, for example) and things like public trust that has to be ‘earned’ through service and performance in activities similar to those required for positions of power. A kind of ‘civic credit’ points currency. The credit points could then be required as up-front performance bond or ‘ante’ — that will be lost in case of power abuse or poor performance — or as the ‘release’ currency for the person in power to obtain the resources needed for a decision. While the account will be ‘used up’ with each decision and its total depletion reducing the person’s power to zero, successful decisions will ‘earn’ more points. Power points may also be transferred from supporters’ accounts to leaders (to the limit of those supporters’ accounts of credit points) to be depleted with each decision, lost for unsuccessful decisions, or regained with successful performance, and ‘repaid’ to supporters. The accounting problems for such schemes may still look prohibitively complicated but are entirely within the capability of available technology, technology familiar from credit cards, credit scows, driving violations records etc. Meeting the challenges sketched out above will require considerable research and development, discussion, testing, education to familiarize people with the application of solutions. Some such solutions are still entirely at the conceptual stage; for others there are existing examples of techniques that can illustrate what the solutions might look like. In the following, some such examples will be explained in more detail. The examples should be seen as offering demonstration for discussion that solutions are possible and within reach, not yet as readily applicable tools. The first example is the idea of a discourse framework or platform for information sharing and discussion of action or policy proposals. It is based on the ‘argumentative model of planning’ proposed by Rittel . It views the design and planning process as an argumentative process during which questions and ‘issues’ are thrown up, to which people adopt positions (such as ‘for’ or ‘against’ a proposal) and support / defend those positions with answers and arguments. The information system supporting such a process will be structured not in the traditional way with ‘documents’ as the constituting elements, but according to ‘topics’ and ‘issues’. New information technology makes it possible to construct a framework organized in this manner, to which anybody can contribute questions, issues, answers and arguments, and thus become a truly ‘democratic’ tool for citizen participation in public decision-making at small or large scale. 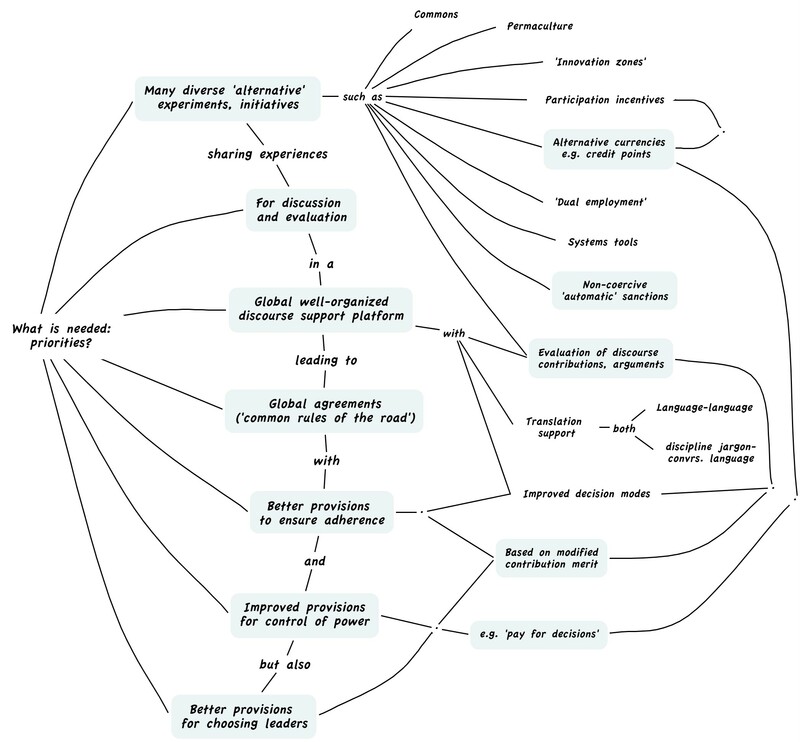 For large scale application, a ‘translation’ service component will become increasingly important — not only to translate contributions from one natural language into all others, but also to translate the ‘scientific’ or technical jargon from various disciplines (even from various schools of thought within individual disciplines) into commonly understandable language. – The ‘evaluation’ component where participants can enter their assessment of the merit of questions, answers, and arguments. This component can be based on the approach developed by T. Mann  for the assessment of planning arguments. In contrast to common opinion polls which only gather support or opposition ‘votes’ from surveyed citizens, this approach provides much more detailed information by asking participants to evaluate individual argument premises according to their plausibility and importance. It thereby helps pinpoint much more accurately the specific aspects of concern by various participants: which features of a proposed plan are perceived as damaging or unacceptable by some, what claims are insufficiently supported by evidence, which issues require more discussion, and encourages the modification of proposals in response to voiced concerns to achieve outcomes more acceptable to most affected parties. Another tool that can support public decision-making is the approach to measuring the value of built environment developed by T. Mann  that can be expanded into more general ‘quality of life’ indicators of the kind that are increasingly discussed as replacements or at least complements to traditional measures of economic performance guiding government decisions — such as growth rates or Gross Domestic Product. The approach is based on assessments of the value (quality) of the occasions offered in an environment, (the occasions constituting the lives of residents) as modified by the functionality of the environment for each specific occasion, and the appropriateness (inspirational value) of the images evoked by the environment. Using such a tool, the expected ‘performance’ of a proposed plan can be assessed in terms of how well it adds to the quality and value of the occasions (e.g. occasion opportunity value) of residents’ lives, considering both ‘new’ occasions added as well as familiar occasions deleted from the basket of opportunities. In comparison with the ‘almost ready for application’ ideas for the discourse framework and measures for merit of arguments discussed in the preceding sections, the solutions for ‘automatically triggered sanctions’ eliminating the need for enforcement agencies, as well as those for better power controls require much more research and discussion. For the sake of better understanding by means of a kind of ideal sci-fi vision, the following scenario might be considered. Each citizen carries a device — a kind of ID card — on which the personal identification information is stored, as well as financial accounts, educational and other ‘competence’ information (that entitles the holder e.g. to operate equipment of hold decision-making positions in society. This could include ‘credit points’ earned not only through acquisition of knowledge, experience, and skills, but also by civic service entitling the holder to public ‘trust’ and holding public office. It could include medical information for use in medical emergencies. Such information will only be stored on this device, nowhere else, to prohibit misuse. The basic information to establish identity is the only part that will be stored in a public registry. Part of this device could also be used to hold information such as the merit of contributions to public discourse (as evaluated by the entire body of participants) — information that can be used to demonstrate competence for public decision-making positions. This ‘currency’ will be used to activate the resources required for the implementation of decisions of the particular office — that will therefore be ‘used up’ with each additional decision, and only be replenished with ‘new’ credit points earned on the basis of the performance of the decisions taken. The same device of ‘credit point accounts’ required to activate resources for any kind of official action can then also be used as ‘security deposit’ for agreements and treaties among larger entities — and instantaneously ‘lost’ or ‘frozen’ upon attempts of violation, so that any implementation of violation activities will be prohibited — as in the simple example of the ignition device sensing whether a driver is inebriated, and preventing the drunk driver from starting the car. These speculations are made in the hope of impressing upon readers both the necessity of developing these tools, and their feasibility — even if actual fine-tuning and implementation will still require much work. Kunz, W. and H. Rittel: (1970) “Issues as Elements of Information Systems.” Working Paper No. 131, Institute of Urban and Regional Development, University of California, Berkeley. Mann, Thorbjoern (1977) Argument Assessment for Design Decisions, Dissertation, University of California, Berkeley. The need for change is a continuing and arguably increasing one. It has not been satisfied, in the U.S, for example, either by the election of Obama to the presidency, nor by its partial repudiation by the midterm victory of many Republican, conservative, Tea Party or Libertarian supporters. It is affirmed every day by the complaints, rants, revelations and accusations by writers and bloggers from all sides. A serious discussion of the remedies, the tools for change, the solutions suggested would therefore seem to be in order. This discussion appears to be somewhat lacking, in comparison with the complaints. If there are actual recipes behind (implied or perceived to be implied in) the complaints — depending on the alleged or admitted camp association of the respective writer — these are often not very clearly articulated. This may be because those recipes are, from the so-called ‘left’ as much as from the so-called ‘right’ or ‘independent’ camps, mostly quite well known: tried and (not so) true but found wanting, even sometimes found to be at the very heart of the problems they are supposed to remedy. Thus, a ‘return’ to the values and principles supposedly guiding the provisions of the ‘founding fathers’ for the fledgling United States inexplicably misses the fact that over time, those provisions have demonstrably not been able to prevent the emergence of the present problems, no matter how strenuously they have been invoked by politicians and others. And the revolutionary solutions proposed by critics of this system seem to have been proven equally deficient in the places where they have been tried, at least in their ‘pure’ early incarnations. So is there anything to be learned from these developments that can be assembled into a strategy for more promising change? It may be useful to begin by surveying things that do not look like good ingredients for such a strategy. First, the reliance on the current ‘democratic’ apparatus of electing representatives — ‘throw the bums out’ and electing different bums into office every four or two years, appears to have become so ineffective that it must be regarded as a mere ploy to perpetuate the stranglehold of other — real — powers over the system. Powers that have so thoroughly taken control of the democratic institutions that it does not seem to matter which party is winning elections. To be sure, the traditional provisions for democratic governance were not only well-intentioned and probably, at the time, the best available means for keeping things on course: division and balance of powers, limits on the length of time representatives and office holders are allowed to serve and remain in power, free speech, free elections decided by majority decision. All if not most of the proposed remedies for today’s problems still rely on these provisions; there are few if any really innovative ideas for strengthening, improving, or even replacing them. So does the insistence on relying on these provisions begin to look like what someone described as the definition of insanity: keeping on doing what has been proved not to work? This does not, in my opinion, mean that the second traditional ‘remedy’ should be seriously considered: that of ‘revolutionary (wholesale) change’ — the all-out radical overthrow of the existing regime, replacing it with a different one. The alternatives to the democratic model that have been tried during the last two centuries or so have all proven fatally defective. Many different reasons have been proposed to explain this. In my opinion, again, the feature they share is a profound failure to install workable safeguards against the abuse of power — a feature that also afflicts the democratic model, albeit to a somewhat lesser extent. The difference between them is that the socialist, communist, fascist and totalitarian governance models failed to control government power, in fact banked on government power as the solution to all societal problems. This eventually led either to their collapse, or to prolonged brutal stranglehold of dictators over their constituencies, in growing misery. In contrast, the democratic model failed to apply proper safeguards against the abuse of power by the private enterprise systems. In the name of ‘freedom’ (and the pursuit of economic ‘happiness’), these systems were allowed to grow to become so big and powerful that they were able to take control of the democratic institutions of government, while overtly leaving its ‘democratic’ trappings in place, such as elections, which could easily be controlled with campaign money and subsequent corrupting temptations of the elected representatives. A third alternative must be discussed — the radical libertarian position of ‘personal sovereignty’ that seems to advocate complete disassociation from the existing collective societal entities, be they governmental or private-enterprise in nature. This remedy looks attractive as long as one considers only individuals or family-size organization of society. It becomes more difficult to imagine workable solutions for the simple survival of these entities in today’s state of humanity: even recipes such as each family ‘growing its own food’ for survival so as to escape the slavery of big agriculture and distribution chains run into familiar problems, say, of equitable allocation of land, given its undeniable differences in quality and productivity, and a growing population that would seem to call for a continuing re-sizing and reallocation (decided and supervised by what entity?) of the land available for growing food. Or: what to do if these sovereign individuals decided to embark on collective projects with some more formal organization, where inevitably, the problem of control of power by the people ‘in charge’ will again arise? So these problems will be the same as in the other collective governance models. So with reliance on (unmodified) traditional mechanisms on the one hand, and revolutionary change on the other, both rejected as inappropriate, and the radical individualist option apparently unrealistic or in the end identical to the others, what features of change proposals should we be looking and working for? The following are some aspects — in the form of questions for discussion, that in my opinion should guide these efforts. • Whatever alternative model will be chosen for adoption, should its implementation be in the form of a sudden wholesale ‘revolution’ imposed from ‘above’ (which in itself implies an entity wielding enough power to effect the change and thereby being in danger of falling victim to the temptations of size and power…) or a gradual piecemeal transformation? Might it be preferable to have the transformation follow a pattern similar to that of a ‘parasite’ attached to an existing hierarchy, slowly growing until it can peacefully transform its structure? The ‘skunkworks’ model of early R&D companies which survived changing conditions by harboring unorthodox and low-cost innovation groups in their basements while working on larger scale traditional projects aboveground, until the innovations developed by the ‘skunkworks’ teams became the standards for the organization, might be a worthwhile one to adopt for the needed transformation. • Would the ‘skunkworks’ model also permit the competitive explorative pursuit of several alternative models at the same time? It is quite unlikely that only one experimental solution woud be avalable for discussion for the transformation of governance or economic systems. Some experiments with a variety of models might be needed to find out what works and what doesn’t. • Consistent with the notion of several experimental alternative models to be tried out at any given time, would it be useful to provide for the possibility of several systems to be operating — in any given place, region, country etc. — in parallel? This would not only offer people the freedom of choice between several ways of running their lives with respect to collective activity, but also make it possible for more gradual transition between them in the face of changing conditions and emergencies. • Should the structure to be aimed for be a ‘monoculture’, or provide choices of several forms of organization? Should too large entities be broken up into smaller independent organizations? How might this be achieved? • Just as there is universal consensus about providing at least basic survival networks for children and elderly people, should there be a basic survival safety net for every citizen, as part of any collective enterprise? One that might be covering such essentials as food, health care, education, access to information, legal services, participation in collective activities and decision-making? Should the right to access for such basic necessities continue to be tied to either ability to pay for them with funds earned from employment, in an era where human ‘work’ in production and other services is increasingly made obsolete by automation) or involuntary collective services? • Should arrangements be considered such as the following step towards at least a more flexible work economy: a ‘dual system’ of employment in which citizens are automatically ‘public employees’ with the option of working for collective infrastructure according to their capabilities, remunerated with ‘civic credits’ by means of which they then ‘pay’ for their allotment of basic necessities, and also working for private enterprise entities? Health insurance, taxation, social security paperwork then would no longer have to be done by employers. The ratio of ‘private enterprise’ to ‘public’ work would be sliding and voluntary. This would allow private employers to simply reduce the amount of work they ask of employees in periods of financial or economic crises (such as the recent crises) instead of having to lay off worker, losing their expertise and causing disruptions in the economy because of the forced displacement of workers, moves to other locations, foreclosures of homes, children having to disrupt their education etc. The public sector would then easily absorb the extra available work capacity of such workers (if these don’t take advantage of extra time to further their own education or start independent small businesses), producing better infrastructure and services helping the private sector overcome the crisis, among other things, using the expertise and skills of workers it already has ‘in the system’. • Private enterprise entities may choose to become involved in public work — a means of survival in times of economic downturn — by taking on the implementation and management of public programs, but at not-for-profit conditions. For example, current private insurance companies may take on the administration of public basic insurance programs (for everybody), putting their facilities, equipment, personnel and expertise to work for those programs (again, on a not-for profit basis). Thereby making it unnecessary to create large bureaucracies to run such programs, while allowing the companies to continue to market ‘enhancement’ for profit policies to their now enlarged ‘captive’ audience of the ‘basic’ public system enrollees. • Could the introduction of ‘civic service ‘points’ — earned by certification of skills (such as driving tests or education certificates) serve not only to grant certain rights (driver license) but also as the vehicle for sanctions and penalties as well ‘ante-up’ prerequisite for positions of power, (to be automatically forfeited upon violation of agreements and abuse)? A form of rewarding officeholders for good work while actually holding them accountable — ‘paying for’ — mistakes and mismanagement? • Should voting be extended — and tied — to actual assessment of arguments for and against proposals and candidates, rather than mere votes influenced by mindless repetition of campaign slogans paid for by entities that then will insist on legislative votes in their favor from the elected representatives? Might voting also be extended to voting for specific percentage designation for different government tasks and programs (what percentage of my taxes for this program as opposed to that one? ), whose budgets then will be set according to the voted-upon percentages and the expeced tax revenues? If revenues change up or down, budget cuts would be in the form of across-the-board percentage cuts, not by simply eliminating programs and departments that have previously been voted upon as desirable by citizens. All parts of the government just will have to do their work with the funds available, — each according to their own best judgment, not according to wholesale legislative mandates that are systemically ignorant of specific conditions in each department.